This was my first foray into the GCACW system. I had head so many great things about the system and was excited to try it out. I finally found Battle Above the Clouds for a reasonable price so I figured it would be a great way to get my foot in the door. I also, am looking to try to get more into solitaire gaming and have found several recommendations for playing the GCACW system solitaire. The scenario takes place over four days(turns) from September 10 – 13 1863. 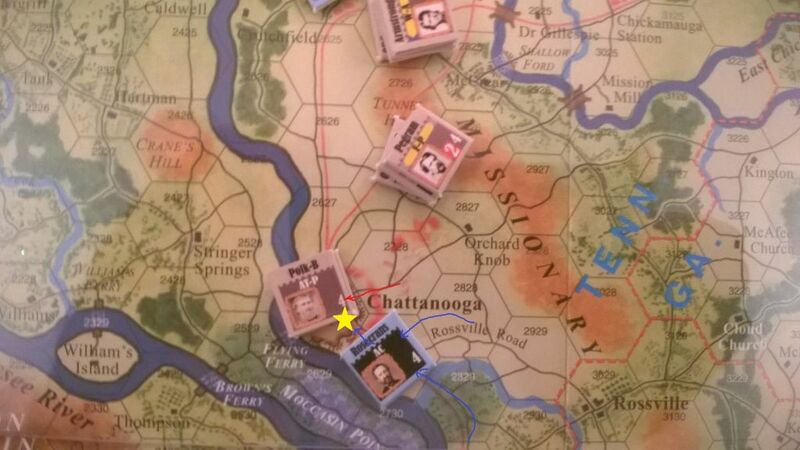 After the union army captured Chattanooga the army had become split. General Rosecrans belied that the Confederate army of Tennessee was in full retreat and wanted to inflict as much damage as possible. However, general Bragg was only tactfully withdrawing. This lead to a situation where a number of union divisions could be isolated and possibly destroyed. For most of the first day most of the divisions and corps on the field are not able to move. 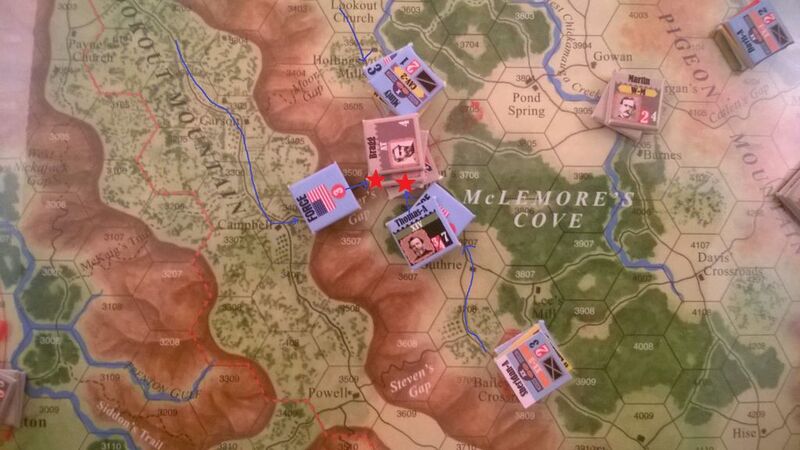 However, near McLemore’s Cove Negley’s division has been isolated and is in danger of being trapped by the enemy. Seeing an opportunity Confederate General Martin ordered his cavalry to encircle Negley’s division and hope for quick reinforcement and attack. Unfortunately, general Cleburne who was advancing to support Martin Had become insubordinate and could not be trusted to take commands. 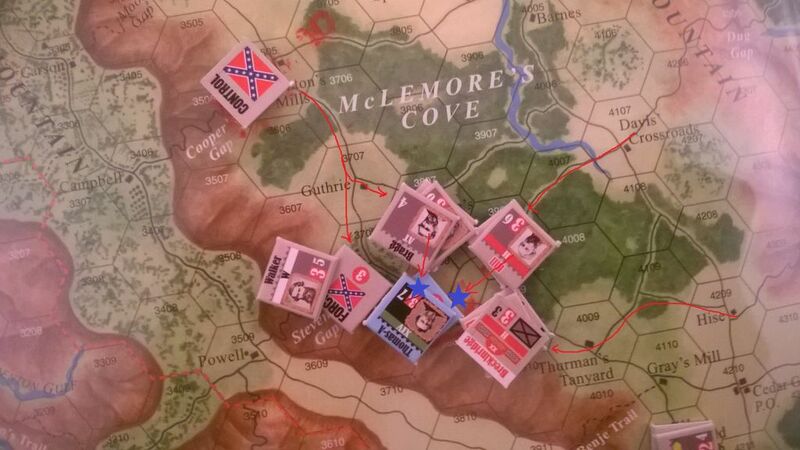 At the last second Cleburne came to his senses (a 6 was rolled on the initiative) and was able to attack Negley. Both sides experienced casualties however Negley was forced to retreat to Bailey’s Crossroads and Cleburne could advance. After Negley’s retreat general Rosecrans realized that much of McLemore’s Cove could be lost if reinforcement did not arrive in time. Therefore, the XIV corp was pushed hard to reach Thorton’s mill before confederate forces could reach it. The rest of the day was quiet, just maneuvering to try and get ready for the next morning. 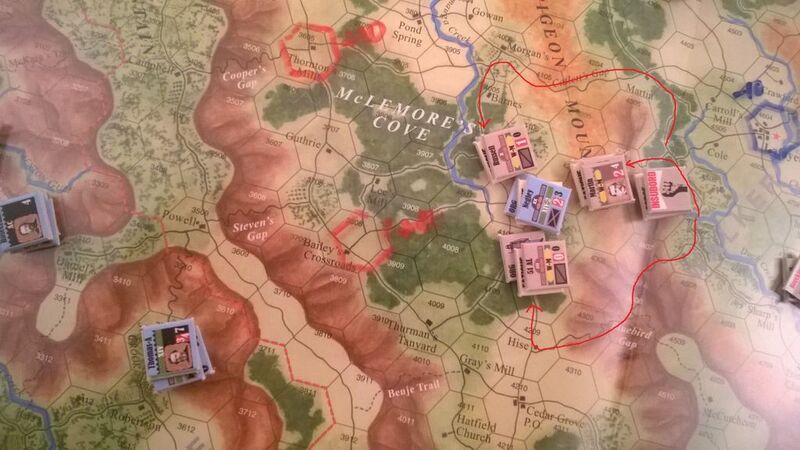 The day started with an assault on Thornton’s mill by Buckner’s forces being commanded by General Bragg. 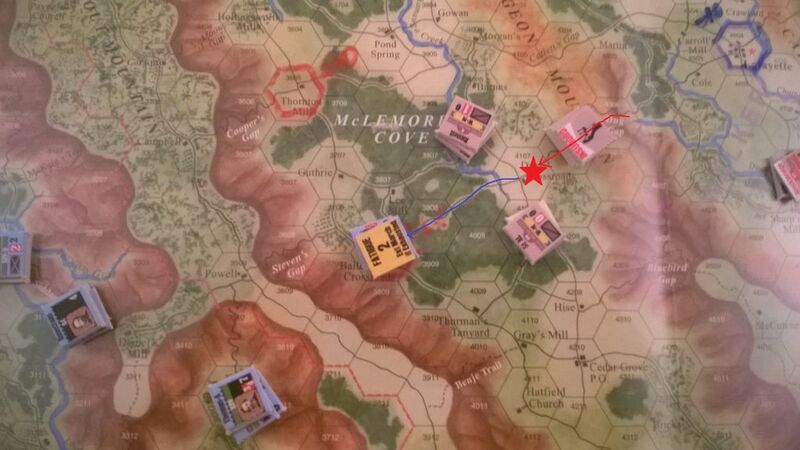 The assault was a success causing multiple union casualties and making them retreat to the top of Lookout Mountain. Union Forces having lost the race to Chattanooga got into place to be able to attempt a assault to free the city from Confederate control the next day. 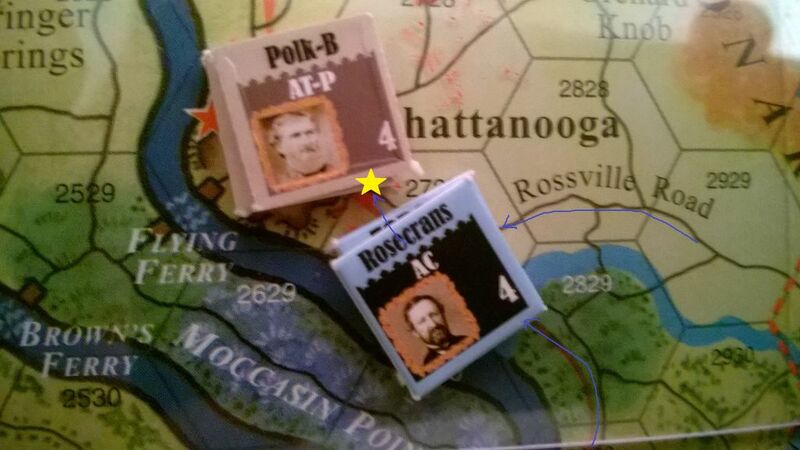 Union Forces now being commanded by General Rosecrans attempted a Grand Assault on Chattanooga. The assault fizzled out quickly and neither side could say they gained anything from the fight. 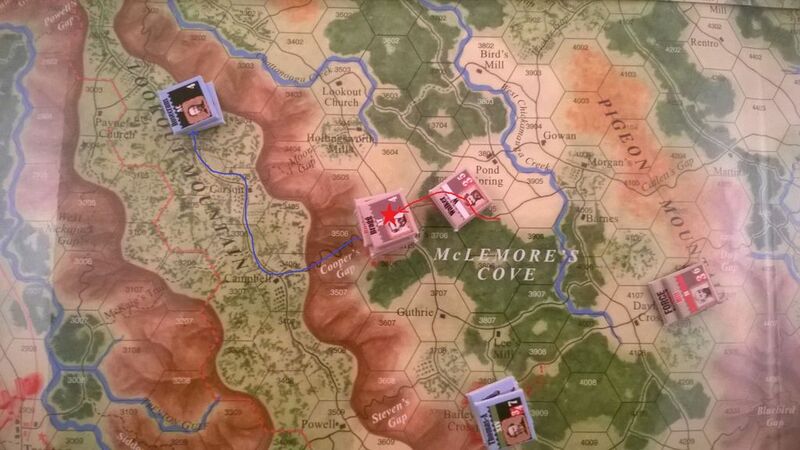 Meanwhile back in Mclemore’s Cove general Thomas was able to reinforce Bailey’s Crossroads and get his and Negley’s forces to entrench. This was a wise decision because the crossroads was soon after encircled by Confederate forces. In an attempt to take the crossroads General Bragg ordered a Grand Assault. The Grand assault failed and one division was left high and dry taking heavy losses. 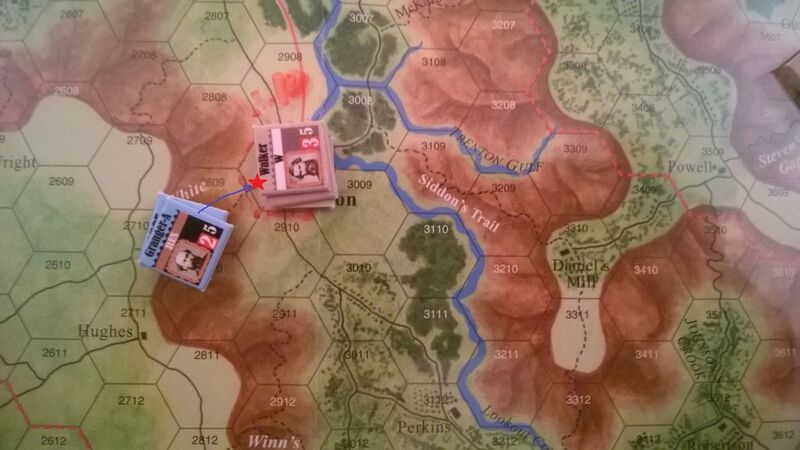 Thomas seeing that there was potential for another assault prepped his forces to refuse flank attacks. Bragg seeing that the defender was only getting more entrenched attempted another grand assault with the same results. The grand assault failed once again and the attacking forces led by Hill took even more casualties. Seeing that Thomas would not be moved from Bailey’s Crossroads General Walker was able to move his forces quickly over Lookout Mountain to Trenton. Union forces were in route to Trenton but had been held up by a slow march (rolling 1’s and 2’s) Once again, the confederates had one the won the race to a key position. 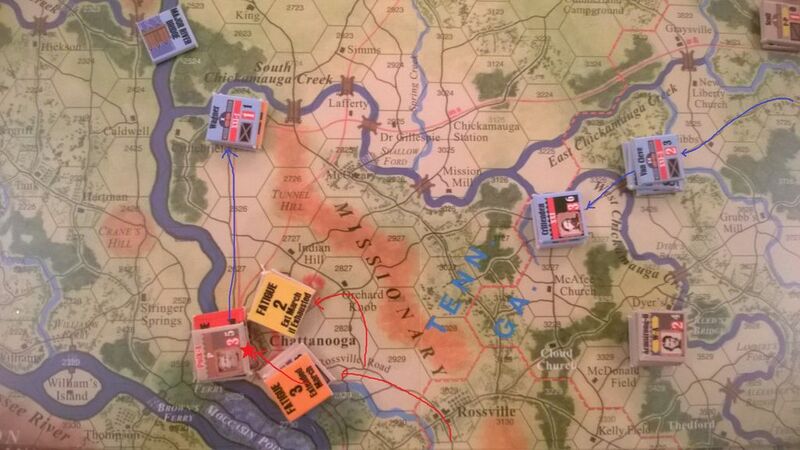 Next in an attempt to take Trenton from General Hill, Granger assaulted the hex but failed with heady casualties. 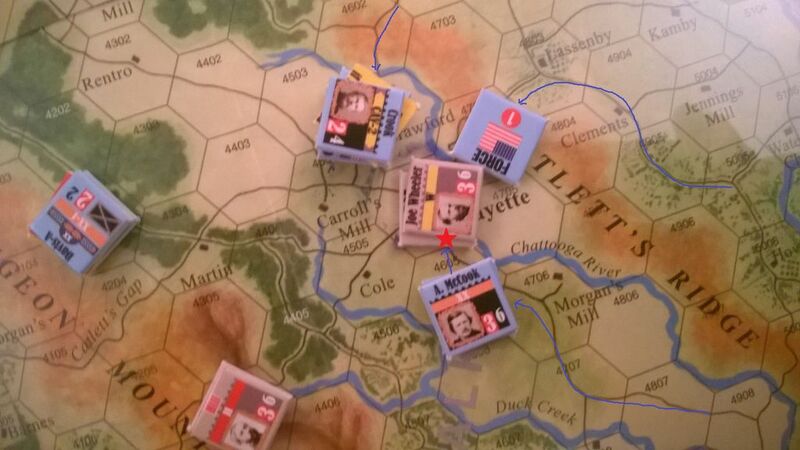 General McCook seeing an opportunity to take Layfette encircled the defending confederate forces and attacked. Unfortunately, the attack went disastrously and the union suffered losses. 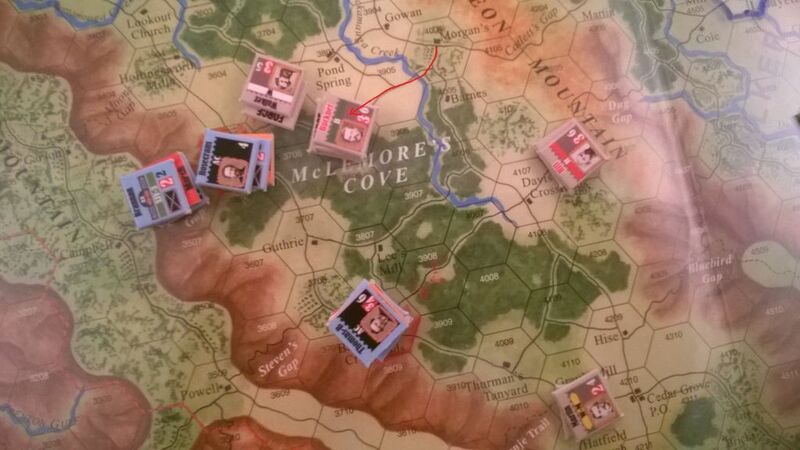 After the disastrous assaults on Bailey’s Crossroad’s Bragg’s forces retreated to Thornton’s Mill sensing they were now outnumbered. The union forces that had retreated on top of Lookout Mountain were now refreshed and ready for action. Thomas also wanting a chance at revenge closed in. Both forces assaulted and both forces were repelled with much loss of life. This was a devastating day for the Union. It started with the hope of demolishing any Confederate stronghold on the area and ended in total defeat. Thanks for the report. This is a really great scenario. And yeah, Bragg is rubbish. One thing about grand assaults is that usually you are paying vps in higher combat losses. It to mention activations. Even if the assault completely fails, or you fail your roll, the units have spent fatigue. The crt is set up that you have to beat the opponent by a significant margin and even against small forces you may take extremely high casualties. The game models well the difficulty in setting up a grand assault, so before committing to one, work out your die roll bonuses ahead of time and figure out the "worst outcome" - whatever that is, you have to be comfortable taking the hit. Often times it is better to make 2 or 3 separate attacks, and typically it is only worth it if you have a high-value objective at stake as well as enough of a VP cushion that a staggering loss won't drop your vps into losing range. 1. Scenario-ending final assaults for the win. 2. A high-risk, high-reward combat - such as the opportunity to capture a force that can't retreat with taking huge losses. 3. 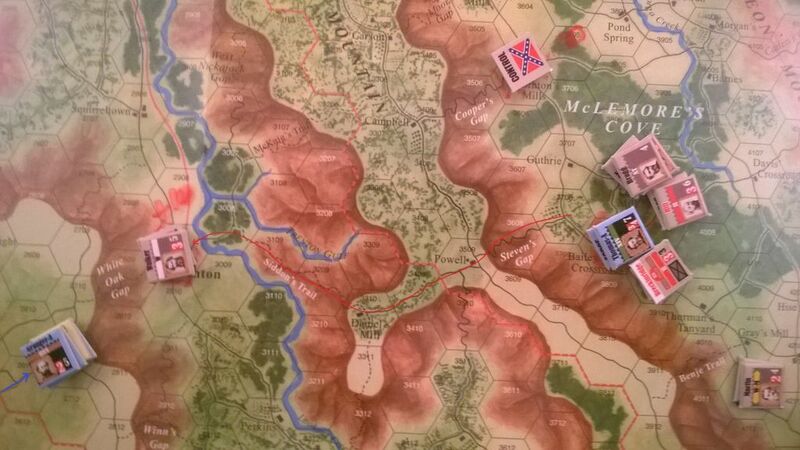 Single high-value objectives (like the Gettysburg intro scenario), in which objective pretty much decides the scenario. 4. High MP value hexes where you need to try and achieve bonus parity. Typically only assault in these cases if you have a 6 command leader and a +2 or +3 bonus advantage. Hope that helps! Nice write-up! If you make smaller attacks aren't you going to be more outnumbered from the beginning? or are you just hoping to soften up the target and since it is a smaller force there will be less casualties? Nice idea to write the VP hexes on the plexi with a sharpee. I'll have to start doing that instead of marking it with counters. There are a lot of things going on to consider (which is what makes the game great). The first consideration when whether to do 3 attacks or 1 attack is that you only need one of the 3 attacks to be successful, but get three bites at the apple -- those are also guaranteed attacks, while assaults could fail on the first (command) roll. Assuming you determine you have a better chance with the grand assault, you could fail the roll (rolling a 6), or maybe only have 1, 2, or 3 of your divisions participating anyway. Regardless of the outcome, each division that was nominated to participate will take a fatigue - even if they didn't attack! The second consideration - related to the first - is management of fatigue. Here, the issue is that you are frequently battling taking fatigue. Sure, you can pass your turn to try and save some of them, but if your opponent also passes, they just stole your other activations. Grand assaults cause you to pay a high cost in fatigue. As I said above, it's generally a high-risk proposition, both because of the punishing CRT as well as the high-cost of fatigue whether or not the assault takes place. A third consideration is that the bonuses for additional combat ratios do not scale -- meaning each multiple only conveys a +1. Consider that a full flank attack gives a +4 under ideal circumstances, roughly equaling a 5:1 ratio! With those higher manpower numbers comes a very high likelihood that you will be losing significant numbers of casualties since in a 2:1 and 3:1 situation (the most common type of outnumbered assault), your higher numbers virtually guarantee that you will be taking manpower losses where as your opponent (by virtue of his lower manpower) will become disordered or if already disordered, then "nothing" could happen. So a high-ratio attack against a small force -- say a 5 manpower division versus a 0.5 manpower cavalry unit is probably worth it without even having to think about it. But a 20 manpower assault against a 5 might not be -- ideally you want your combat roll to be at least +3 in your favor. Just lookin at the CRT, you need to beat the defender by +2 to capture a hex . . . so just to be on "even footing" vis a vis the defender, you need a +2 from the outset. Even so, this assumes that you and the defender tie. Because of that, the decision for grand assaults typically are limited to the list I provided above: it is not normally worth the risk of either (a) failing the command roll and taking fatigues on all your divisions, or (b) succeeding at the command roll, then rolling poorly in combat and taking punishing casualties, or (c) succeeding at the assault, but losing more VPs to manpower losses than you capture when you take the hex! Yes, thanks for the advice. I am learning that in this system maneuvering and efficient use of movement is the key. It is really hard to move a well entrenched defender who is on equal footing without good rolls. In all the assaults toward the end of the game the assault was either even or with a +1 or +2. Then the rolls ended up being awful for the attacking forces (ie 1-6 and 2-5).SO, if you can beat an enemy to vp location reinforce and entrench you are doing pretty good. There's a reason the old adage was to "get there firstest with mostest." Usually - but it also gives rise to complaints about the system that I have aired in other fora. In this game, it is often better to be on the defense than the offense. It is also often better to have flank bonuses rather than numerical superiority. In fact, I would say that in your quest as the attacker to gain the most bonuses, grand assaults for numerical superiority should - in most cases - be your last choice. It is far better to get artillery advantages, flanks, terrain bonuses, a leader with a better tactical rating than the defender, or a combination of those than it is to gain numerical superiority in a single attack. In my experience, the better players are the ones who use the terrain and the EZOC rules to their advantage. As an example, many of the best opponents I faced would, when on the defensive, spread out a bunch of divisions with 2 hexes between each division (and watching out for those restricted ZOCs), so that they would have a "wall" of ZOCs for the attacker to march through. When the attacker chooses a point of attack, they would both make "sacrifice" attacks to hopefully get a "D" result even when out-numbered. This can, if properly used, fatigue out stacks of attackers -- the objective of the "defensive offense" was not to kill the enemy, but tire them out to restrict their maneuverability and buy time - it can be well worth a 1 or 2 MP loss if you are protecting a chain of VP hexes behind your "wall". Grand assaults, similarly, also take a lot of time to set up -- usually time that is better spent outflanking the enemy. I felt that my game elevated quite a bit when I realized that you shouldn't be in a hurry to engage the enemy - take your time, set up your attack, and hope the activation rolls break your way. If they don't, take it on the chin, and start over to set up your flanks and attacks again. Hopefully, eventually, the dice will break your way eventually. This series' thesis - one that I do not necessarily agree with - is that maneuver and tactical positioning is superior to numbers in nearly all instances. This may be true, IMHO, up to 2:1 odds, but much beyond 2:1 odds, the crush of men and material historically carried the day except for a few very wonky exceptions. But as long as you recognize that the game has these assumptions baked into the mechanics, it does cause you to step back and start behaving very similarly to the ACW generals. Very few engagements at the point of contact resulted in 2:1 odds - from a local perspective the armies were almost always evenly matched. The union's numerical superiority was typically found elsewhere, whilst on the battlefield, the reality skewed toward numerical equality. Again, I'm partly speaking out of my arse, and there are many valid counter-arguments. But if you reject the game's underlying thesis, you are setting yourself up for frustration because the game is designed to encourage maneuverability. My issue is that it very rarely results in set-piece battles. 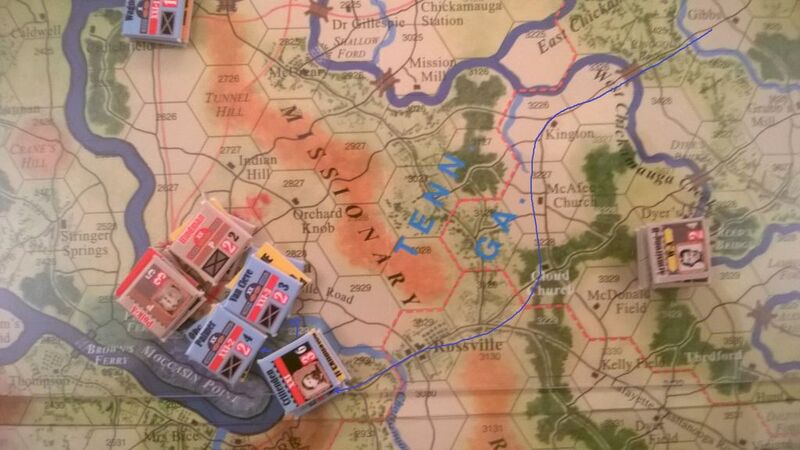 Consider that Gettysburg fought on a GCACW map would have been fought within 3-5 adjacent hexes! You will never get a set-piece battle over an insignificant objective as happened over and over again in the war -- instead the tendency is to string out one's forces and strike when you think the odds are best, typically with a barrage of successive attacks, and hopefully without your opponent winning the initiative. Enjoy - this is one of the best game systems I have ever played, and my complaints are completely overwhelmed by the strong narrative nature of the game and the subtle nuances within the mechanics. There is a reason this game series has survived for so long with such a dedicated base of players. I am one of them.